A user wanted to know if it was possible to disable the Team calendars that are listed on Outlook’s calendar navigation pane. While it can be handy for users who manage one or a small number of calendars, the navigation pane is cluttered when the user manages several calendars. Sure. Individual users can expand the Calendar Groups button in the Manage Calendars chunk and deselect Show Team Calendars. This can also be controlled through group policy. In the policy editor, browse to Outlook, Outlook Options, Preferences, Calendar Options, Schedule View. Team calendar are controlled by the Prevent Reporting Line Group Calendar from appearing. 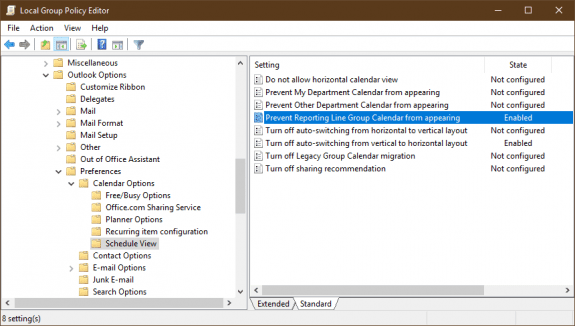 You can also use group policy to prevent My Department and Other department calendars from showing on the calendar navigation pane. Use a DWORD of Disabledepartmenttreefor the Department calendar and Disableotherdepartmentcalendar for Other Department calendar. For global action, we can set this value via GPO. These policy are configured for Outlook , so we have to use Group Policy Managment with Outlook 2010 and 2013 Administrative Templates. So we have to create new policy linked to appropriate OU : click Create a GPO in this domain, and Linki it here… This Policy is created for user, not computer. And Set policy Prevent Reporting Line Group Calendar from appearing .